Do you have a social impact project with a financial innovation strategy? An opportunity to connect with investors, the business academic community and other entrepreneurs with financial innovation strategies. Our aim is to find and support innovative strategies for financing your social impact project. We give you the opportunity to connect with investors, the business academic community and other entrepreneurs with financial innovation strategies in the IE Business School in Madrid, one of the best business schools in the world. Used crowd funding through platforms such as Kickstarter, IndieGoGo, etc. Received an ethical loan from banks such as JAK, Triodos Bank, Shared Interest, etc. Received Islamic finance non-interest loans through banks such as Al Khabeer, National Commercial Bank, HSBC Amanah, etc. SCIEF Center, with the collaboration of IE Business School and King AbdulAziz University, are happy to announce the 3rd edition of ‘What is Out There?' Competition – An opportunity to share your share your initiative and make it grow. You have until April 16th to send us the application form! Jury Choice Award: The SCIEF jury will select the best 2 projects based on the efficiency of the social need tackle, the quality of the formulation of the financial challenge and the viability of the financial solution proposed. These projects will win an all-expenses paid trip to Madrid (Spain) and access to the final round of the Competition, and the Social Impact Finance Forum, in which they will have the chance to connect with investors, the academic community. Final Winner: The winning project will receive a 2000€ prize to finance his project and make it grow. 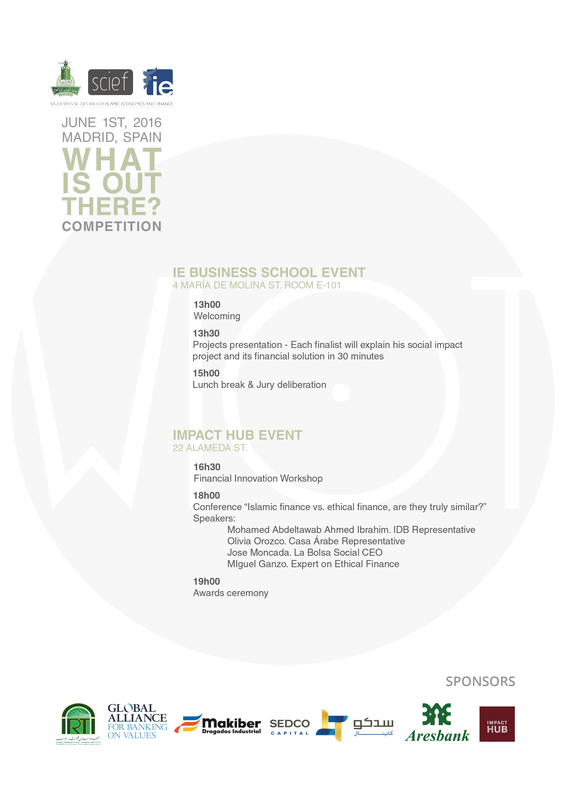 Join us on June 1st in the WIOT Final Event at the Impact HUB Madrid!